So Carl and I have been busy, or I have been busy and Carl has been hanging out in the rabbit barn for a project. This project was one that involved a lot of spray paint which is not healthy for Carl. This project was devised by my wife. She was helping a friend have a birthday party for her children. We took a few items and a lot of spray paint to make this. We started this project with a few supplies. 2. 1/2 inch PVC pipe and fittings. 35 feet of pipe and a LOT of fittings. So then we started…. My wife and I started this project with an idea to make a cupcake stand. Then it grew. Now we have two circular pieces of pine one 24 inch in diameter and the other one is 17 inch in diameter. This picture is where we started stabbing the pipe into the center section of tubing. We used my drill press to make holes for the pipe. And it continued to evolve. Then it was ready for paint. DID I mention a lot of fittings random fittings. So then the spray paint started. First my shop turned white as snow. Then my shop became a candy apple red. My clothes, my chair and yes everything. We didn’t have any rain here in Texas until I started to paint by the way. Next, we have to find something to hold the goodies. Then they have to match. Completion!!!!! One comment is that it didn’t travel very well and you have to tweak it to get it through a normal size door instead of my shop’s double doors. But now Carl is back and not too happy about his vacation to the rabbit barn. Now we are doing some magnetic boards to sell…. 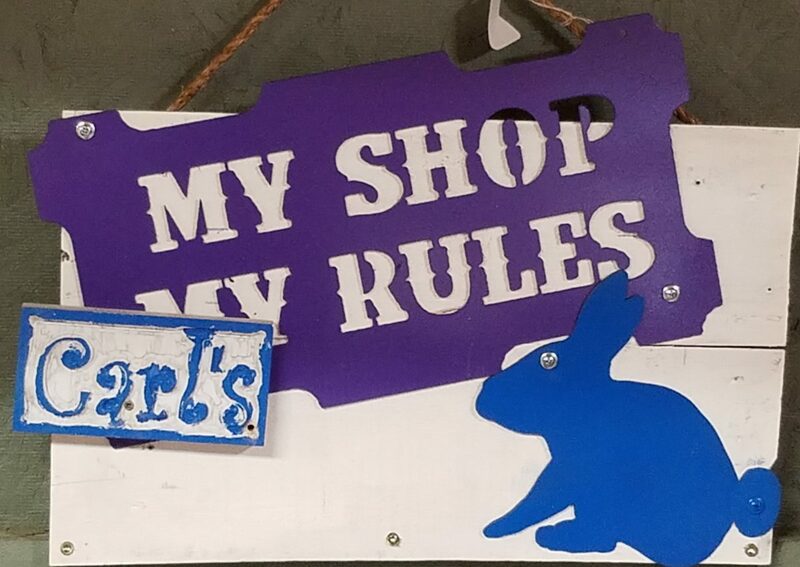 Carl is back to being shop manager and listening to Yanni for stress relief because of his trip to the rabbit barn where there are many more rabbits.